The Past, Present and Future Black Boston Tufts Univ African American Freedom Trail unveiling. 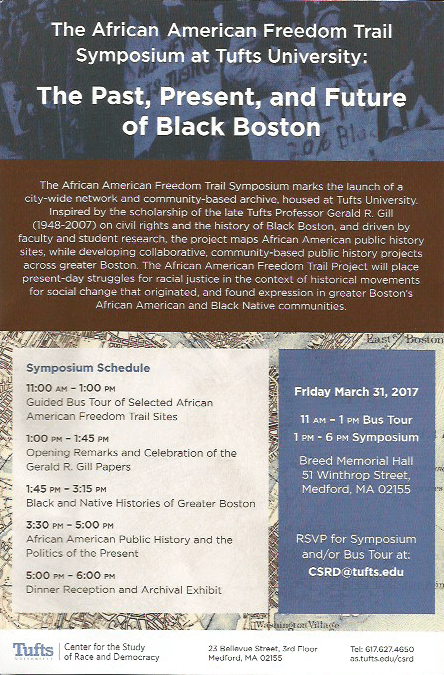 Medford, March 31, 2017 – The African American Freedom Trail Project is a city-wide organizational network and community-based archive, housed at Tufts University. Driven by faculty and student research, the project maps African American public history sites, known and unknown, while developing collaborative, community-based public history projects across greater Boston. Through collaborative research, archival exhibits, oral history projects, and community engagements, this project aims to develop African American historical memory and inter-generational community across historic African American communities in greater Boston. Ultimately, The African American Freedom Trail Project places present-day struggles for racial justice in the context of historical movements for social change that originated, and found expression in greater Boston’s African American and Black Native communities. Brought to you by the CSRD, the Africana Studies Program, The Africana Center, the Office of the Provost, the Office of the Dean of Arts and Sciences, the Department of History, Digital Collections and Archives, The DataLab, The Jonathan M. Tisch College of Civic Life, and the Diversity Fund at Tufts. Next A price list for Boston apartment rents hangs in a window on Huntington Ave.
Sign-up for updates by email.